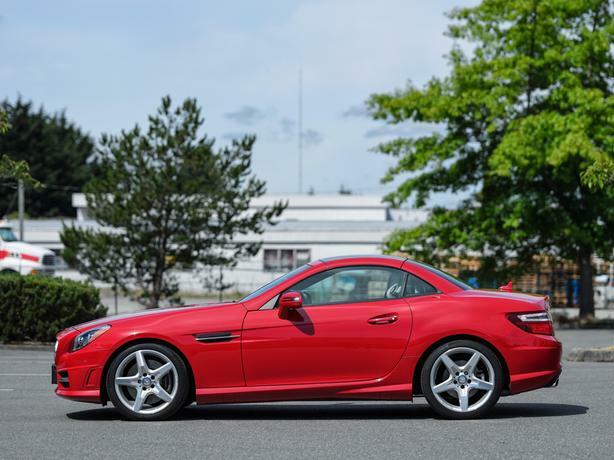 One owner, low mileage, Vancouver Island M-B SLK 350 roadster. 3.5 litre V6 DOHC 24V. Immaculate inside & out. All maintenance completed by Three Point Motors in Victoria, BC. Recently serviced and ready to go. Fire Opal (red) with beige leather interior, Premium Package, Parktronic w/Parking Guide, Analogue Clock, Wind Screen, Dual Zone Climate Control, AIRSCARF equipped, Panoramic Vario-Roof, Comand APS W/HDD Navigation, Sirius Satellite Radio, Dark Ash Wood trim, Harmon/Kardon Logic7 Surround Sound, Keyless GO, Aluminum Inlay Backside, DVD Player, Direct Steering, Integrated Garage Door Opener, LED Daytime Running Lights, Power Adjustable Passenger Seat, Auto Dimming Mirrors, Memory Package w/Power Steering Column, Steering Wheel Shift Paddles, Rain Sensing Windshield Wipers, 7-speed TRONIC Automatic Transmission, Bi-Xenon Headlamps, SmartKey Remote, AMG Styling Package, AMG 18" Wheels, Heated Front Seats, Power Lumbar Support, Winter Floor Mats. Garage kept. No Accidents. N-S. See link for additional photos. Financing options may be available. Serious Inquiries Only.